com 513-260-9025. Earth day site. Everything you want to know about solar power from the experts, the homeowners! Next month we’ll be attending two great events that include solar panels. 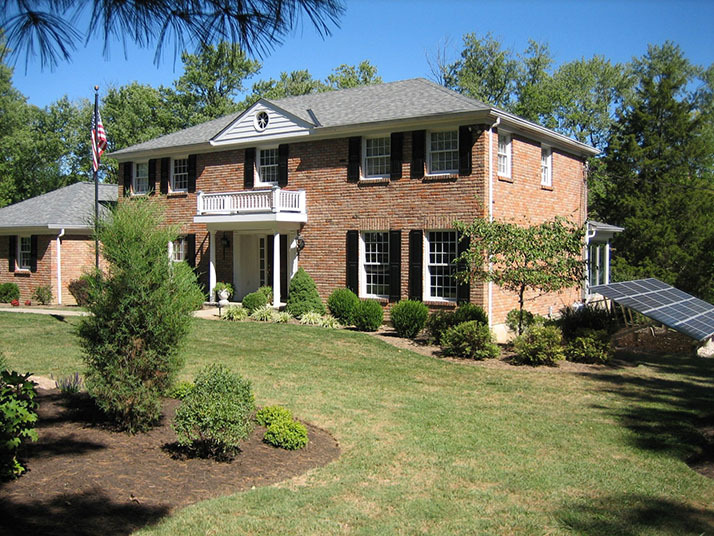 The Melink Residence tour in Indian Hill September 19 and the eight Green Energy Ohio Solar Home Tours September 30th. INDIAN HILL, Ohio — You have to peek out a window in the sunroom or walk around to the south side of Steve and Mary Frances Melink’s Indian Hill house to get away from its traditional American ambiance. There, a few feet from the orange-brick building stands a slanted wall of 20 photovoltaic cells that absorb energy from the sun and power the house. The Melinks’ solar panels aren’t the only energy-saving system the couple added to their 1974 house over the 20 years they’ve owned it, but they are the only visible ones. Hidden but essential to the couple’s near-zero energy bills are a geothermal heating and cooling system, extra high R-value attic and wall insulation, a heat-pump water system, low-e glass windows and long-lasting LED lights in the most-used fixtures. Further earning the Melink family all-star “green” status are the one electric and two hybrid cars they drive. Throw in the fact that Steve’s Melink Corp. headquarters in Milford is certified platinum by the U.S. Green Building Council’s Leadership in Energy and Environmental Design (LEED) program and you could call them superstars. But when it comes to the style of their 3,192-square-foot, 4-bedroom, 3½-bathroom home, the Melinks are All-Americans. No charge for USGBC Ohio members for the tour (you can bring a guest), join the Ohio Chapter. If you don’t have a USGBC Ohio membership registered account, go to www.usgbc.org and click on “Account” in the upper right. A window will come up, click on the “Don’t have an account? Create one.” Once you register your free account, you should be able to pay your dues for the “USGBC Ohio Chapter”. You don’t have to register as a USGBC business. Non-members are asked to donate $15 per person at the door. Contact Chuck Lohre to register for the tours or be introduced to any of the owners of past and future tours, [email protected], 513-260-9025. You will receive the Melink’s home address once you register for the tour. Complete tour info. Green Energy Ohio Tour. These homes aren’t listed yet, the owners are in the process of registering. Andy Holzhauser, Janice Liebenberg and daughter Olivia moved in six months ago to their redeveloped townhome on Elm St. near Washington Park. The home hopefully will be rated LEED Platinum, the highest designation for sustainable development. The Enquirer posted a few photos from the OTR Future Leaders Holiday Home Tour. And here is another article about the home from Brent Coleman with Channel 9. This project consists of 18, 335 watt, 72 celled Suniva panels. A 6.0KW Solaredge inverter and 18 Solaredge optimizers transfer the power produced on the roof to the home and convert it from direct current to the alternating current the home needs. This system will produce approximately 6,810 kWh of electricity annually. That is over 60% of the average US household. This modern style LEED Gold home design has a number of notable sustainable design features, utilizing corrugated metal, fiber cement panels, and cedar on the exterior. Passive solar orientation was implemented in the design. There is a large south facing white metal roof for solar panels/home battery installation. Cincinnati Enquirer article by Shauna Steigerwald, “Cool Homes: In Northside, Minimalist Goes Green.“ Learn more. LEED Silver home that’s boiler free. Heating and natural cooling from passive and thermal solar sources. Yes, it has no boiler. It is so well insulated that its only source of heating is from sunlight coming in through the south facing windows and the hot water generators on the roof supplying heating to their floors. The Kempers purchased their home in 2015. It was built in 2001 by Drees. They are slowly and step by step upgrading for efficiency by installing a 7.56 kw PV system in January 2017 and upgrading the attic insulation. Their PV system is expandable and they hope to be net-zero one day. This home addition and remodel was a labor of love for the owners, a yoga instructor and US EPA employee. From design through construction, every detail was chosen to reinforce their mantra of living lightly. The home’s heating and cooling is supplemented with a solar thermal powered radiant floor heating system. Solar PV was installed to offset their energy bills. October 31, 2014 article by Cincinnati Refined. Learn more from Greener Stock’s Houzz page. This modern style home is one of the most energy efficient home in the region. Their first year energy cost was about $200! The home also has the only rainwater toilet flush system we have seen. Learn more at the house blog. Cincinnati Magazine article article April 2006. Cincinnati Magazine article March 2008. Environmental Design and Construction Excellence in Design Award 2008. Age in place net-zero home with 12.46 kWp – 38 panel PV system. Home features include R23 walls, R48 ceilings, Pella triple pane windows, Honeywell EVR air exchanger. HERS Rating of -3. Chevy Volt daily transportation. The Meldahl hydroelectric facility is a 105 MW run-of-the-river hydroelectric power plant providing new, renewable generation to the region. Located near Maysville, Kentucky, the facility is the largest hydroelectric power plant on the Ohio River. The Meldahl project diverts water from the existing U.S. Army Corps of Engineers’ Dam through bulb turbines anticipated to generate an average gross annual output of approximately 558 million kilowatt-hours (kWh). The powerhouse contains three horizontal 35-MW bulb-type turbine and generating units with a total rated capacity of 105 MW. Excavation and cofferdam construction began in 2010 and powerhouse construction began in August 2011. The plant reached full commercial operation in April 2016. American Municipal Power, Inc. (AMP) and its member communities own and operate facilities that generate power. Member communities, including Hamilton Ohio which receives 50% of it’s electricity from Meldahl, participate in ownership of individual assets according to their unique needs and priorities. Contact Billy Rook to make your reservation. All guests are required to register. What’s the best way to learn about Green Building?